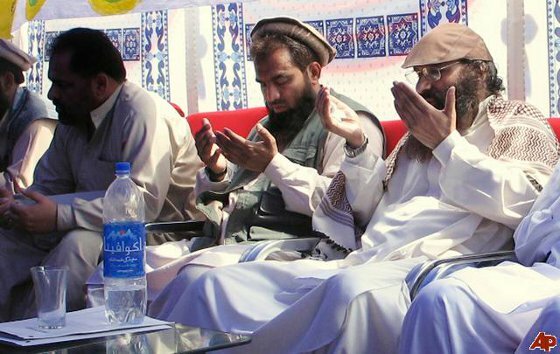 Zaki-ur Rehman Lakhvi [center], the military commander of the Lashkar-e-Taiba who has been implicated in the November 2008 terror assault on Mumbai, prays with Syed Salahuddin [right], the leader of the Hizbul Mujahideen, just two weeks after the November 2008 Mumbai attack. Associated Press photograph. The US Department of State added Hizbul Mujahideen (HM) to its list of Foreign Terrorist Organizations today. As with the official designation of HM’s emir, Syed Salahuddin, State highlighted the group’s activities in Kashmir while ignoring its connections to the bevy of Pakistani and regional jihadist groups, including those that fight against US forces in Afghanistan. The brief designation omitted HM’s support for al Qaeda in the past, as well as its relations with other jihadist groups in Pakistan, Afghanistan, and India, such as Lashkar-e-Taiba. Hizbul Mujahideen also receives support from Pakistan’s military and the Inter-Services Intelligence Directorate (ISI), which allows the group to operate openly inside Pakistan and Pakistan-occupied Kashmir. Salahuddin, who leads HM, was added to the US list of specially designated global terrorists on June 27, 2017, just as President Donald Trump met with Indian Prime Minister Narendra Modi. In addition to serving as the emir of HM, Salahuddin is also the chairman of the United Jihad Council, which is supported by the Pakistani military and the ISI. The focus of the United Jihad Council is waging jihad against Indian institutions inside Kashmir, but the council also serves as a bridge to other jihadist groups operating in the region. Lashkar-e-Taiba and Jaish-e-Mohammed, two groups that are on the US and United Nations lists of terror organizations, are part of the United Jihad Council. Salahuddin operates openly and is immune to arrest from Pakistani authorities. He is known to maintain an office in the Baila Noor Shah area of Muzaffarabad, the capital of Pakistan-occupied Kashmir. The Pakistani government refuses to act against Salahuddin and other terrorist leaders, despite their direct involvement in terrorist activities. He is also known to raise money for jihadist groups operating in South Asia. In July 2012, Salahuddin spoke at a fundraising and recruiting drive for jihad in Afghanistan and India, and said Pakistan is the victim of a US and Israeli conspiracy. At the conference, which was held in Rawalpindi, he stated that his fighters were waging jihad against the US. The month prior, Salahuddin threatened the Pakistani state if it withdrew its support for jihadist groups. At the time, Pakistan was pressuring jihadist groups to pare back activities in the Indian state of Kashmir and Jammu. Salahuddin also attended funeral of Engineer Ahsan Aziz, a jihadist killed in US drone strike in North Waziristan in Aug. 2012. According to Aziz’s father, his son was based in Waziristan for a decade and fought in Afghanistan. “We are fighting Pakistan’s war in Kashmir and if it withdraws its support, the war would be fought inside Pakistan,” he said, according to The Times of India. About time the US finally banned Hizbul Mujahideen, an islamic terrorist group supported by Pakistan’s ISI and is aligned to Hamas, Muslim Brotherhood and the Jamaat-e-islami’s ideology. Interesting to point out that a new group has brokered from Hizbul Mujahideen called Ansar Ghazwatul Hind, which has pledged allegiance to Al Qaeda and is headed by Zakir Rashid Bhat (nickname: Zakir Musa). Interestingly the Global Islamic Media Front announced that group’s formation last month. I predict this new group will fizzle out, as the Pakistani army certainly won’t give them free access to weapons if they know an organisation aligned to Al Qaeda is totally against them.